If you're lucky, your DLSR might shoot seven or eight frames per second - and in the most part that is plenty fast enough to capture the action. But sometimes you might need a slightly speedier capture which is when you can reach for a video camera which frequently captures 60fps, or sometimes 250fps. This can produce amazing slow-motion footage or stills which display the sort of action which is otherwise lost in the blink of an eye… so imagine what the Phantom Flex camera can do, it records an incredible 2,564fps. And in case you are wondering what that looks like, we've got a handy video for you shot by photographer Tom Guilmette. Guilmette was recently working in Vegas and decided to test the Phantom Flex camera almost to its limits - he recorded at 1080p 2,564fps out of a possible 2,800fps. 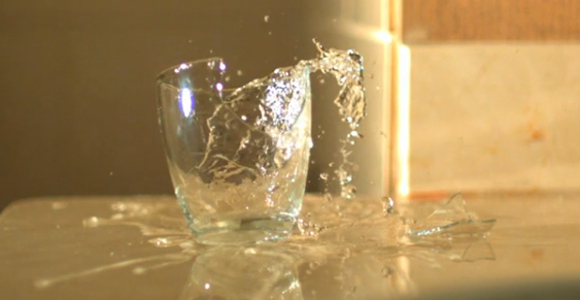 As you can see that's plenty fast enough to see the detail in a drop of water, a smashing glass and a falling lightbulb.